In Victorian times, large building schemes like the Elan Valley water works were often very dangerous for the workers. There were none of the strict safety rules of today, and many 'navvies' lost their lives and many more were badly injured. The large numbers of workers in the Elan Valley during the dams scheme meant that an accident hospital was essential. It was built close to the temporary village on the far bank of the river, and it was never short of patients ! Like the other services provided by the Birmingham authorities, the accident hospital was run to a very high standard for the time. 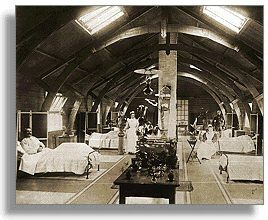 The main ward, pictured here in 1897, was clean and bright, with carpets, flowers, and a warm stove. The main dangers for the workers during the building of the dams came from falling rocks, explosives, railway accidents, eye injuries from chiselling stones, and even drowning in the new reservoirs. There was another hospital in the Elan Valley during the building of the dams, but this was located well away from the village, because it was an isolation hospital for workers with infectious diseases !